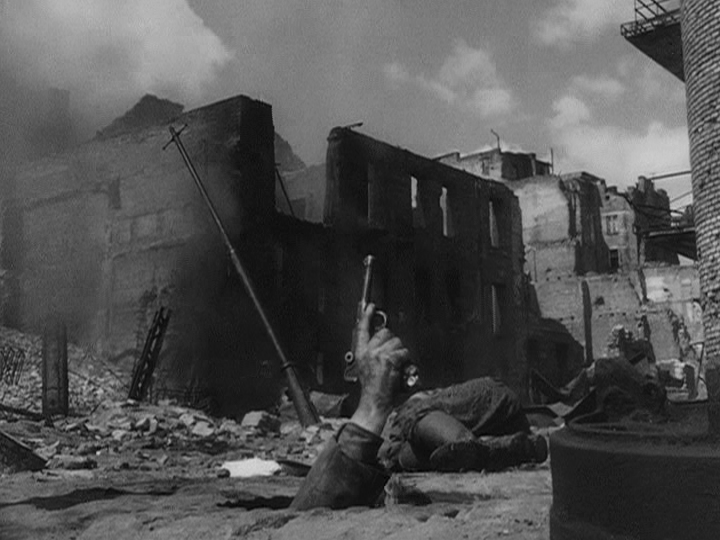 Often times you can get a general idea of the type of film you are about to journey through from the tone of the opening credits, and thus it was clear that Kanal was going to be a pretty gloomy beast to deal with when the first thing we see are overhead shots of destruction and devastation, clearly the result of some sort of combat. What we are witnessing is Warsaw, Poland towards the end of World War II, at a time when the strength of the Polish army is diminishing rapidly as they attempt to fight off the Germans. During the first act I was concerned that I was falling victim to a feeling of war film fatigue, because frankly after seeing so many different versions of cinematic combat I have grown weary of battle sequences unless they have something completely unique to deliver. However, I knew I was in for something different, something fascinating, something special when a group of soldiers with no where else to turn decide their last and only hope is to crawl down into the sewer system beneath the city and search for a way out. The already cramped tunnels feel all the more cramped because director Andrzej Wajda utilizes space as a vital way to create an ominous atmosphere, zooming in tight on his subjects to make us feel just as claustrophobic and desperate as the soldiers feel. The way the sewer is lit makes their shadows dance across the walls in haunting fashion. On a technical level, Kanal is impeccably crafted. This is an eerie film that balances an intense feeling of realism with moments of flat out unsettling surrealism, like a nightmare that you wake up from and you aren't quite sure if it really happened or not. Despite being nearly 60 years old, Kanal not only doesn't feel hampered down by genre fatigue, it transcended any preconceived notion I had and managed to feel fresh and memorable.